In the past two weeks, we haven’t been up to a whole lot. Epic came with me to deliver a CARO rally obedience seminar in Winnipeg. It was her second time in hotel, her first time in an elevator and her first weekend in the portable fabric crate. We survived, the crate survived and no barking in the hotel room at the kids running in the hall! 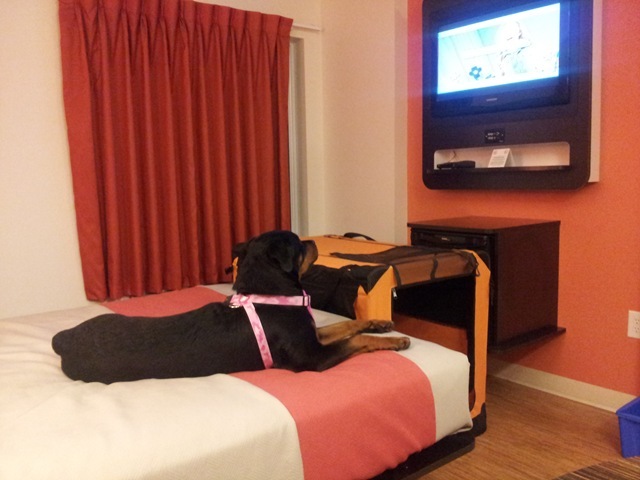 She was very interested in the TV at this hotel and especially interested in the MiniPops commercial…but I’m not buying her the MiniPops CD! Since we have our first rally trial coming up next month so I have been spending some time working on the rally exercises that we really find challenging. Epic has the turning down quite nicely but somewhere, somehow I have taught her that if I make a tight turn to the left, she should probably sit down. Depending on the judge, this could cause a loss of points or an NQ. I could just make a wider turn but, that too would incur deductions in the rally ring so back to the stool/target work we go. The video below is of me working with her moving to the left using a FitPAWS target instead of a stool. My plan is to click her for moving with her rear off the ground, and to reward her up in a stand. I was a bit late with the click a few times but you can see she is beginning to get it. I have also been working a lot of stand from sit. I’d like to teach Epic a kick back stand where the dog anchors their front feet and stands from the rear as opposed to stepping into the stand. I like this stand because it looks sharp and because it keeps a dog in heel position which sets them up better for a straight down or sit from the stand, in my opinion. I don’t have any video this time but hope to have some next time. 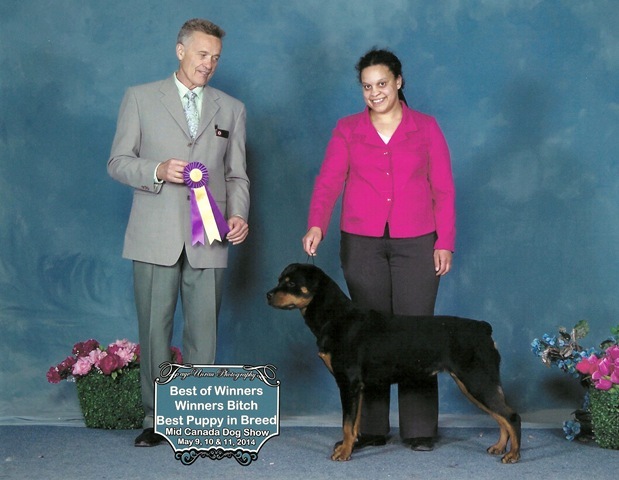 Last weekend, Epic and I attended our very first conformation dog show. We have been preparing at home and in class for some time now and a local show provided the perfect opportunity to put our skills to the test. Since it was Epic’s first show, and because I had some teaching commitments I decided that we would go to the Friday night sanction match, pop in for a quick visit before class on Saturday and enter one show each day Saturday and Sunday. At the Sanction match on Friday, Epic had a very good time. she did tricks for hotdogs while we waited, she met a few new people and our time in the ring was fun for her. Compared to our conformation handling classes, the ring was relatively empty so we had plenty of room. Epic gaited around the ring and then for the ‘down and back” without any of the sniffing she did at the last match and she nailed her free stack in front of the judge on the down and back. I felt much more relaxed than last time however the judge asked me to repeat the down and back going slower. I’m not 100% sure what this means but I’m guessing that the increased speed did not give her a clear picture of Epic’s gait. 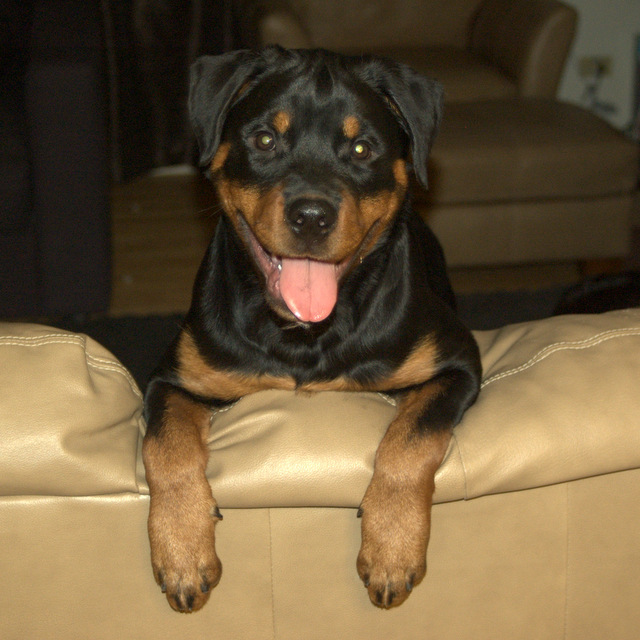 On Saturday, we arrived in time to watch the Rottweiler class. 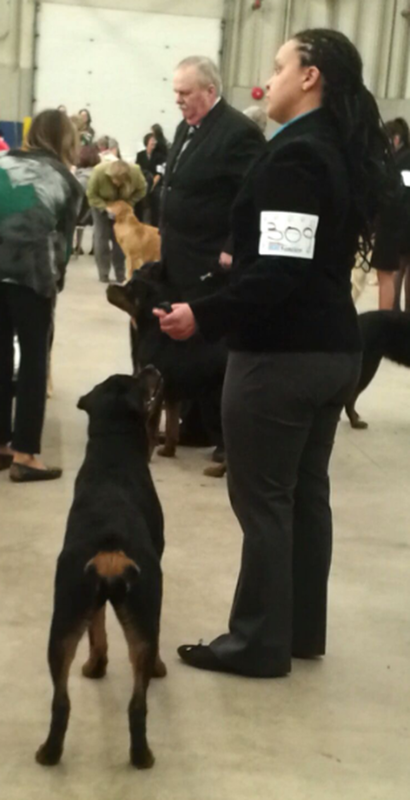 There were seven dogs altogether, which is a great entry, last show in Brandon had only one Rottweiler entered. Most of the dogs entered were puppies about a month younger than Epic. All of the puppies were larger than she was and all of them were well prepared, since they are owned by seasoned breeders/owners/handlers. While I watched the class, Epic had some down time in her crate. She fussed a bit as I left her but settled in nicely after that. Sunday was our first show. I knew Epic was ready but was nervous all the same. She showed as well as she did Saturday but the judge thought both other Female Puppies were nicer than the was that day so we left with a 3rd in class ribbon. Epic holding her stack ringside and paying attention. Too bad I am missing it! I was slightly more nervous about the Monday show because our judge was a larger, taller man than I think she has seen. Epic on the other hand, thought he was just great! The judge’s ring procedure was a bit different this time and I felt like Epic got more of a look than she had on Saturday. This judge also asked me to repeat the down and back, so I really need to figure that out and/or take a valium before going into the ring! When all was said and done we got a second in class ribbon and a reserve winners female ribbon. Thinking back over the weekend, I am thrilled that Epic is a functional dog in a new , challenging and busy environment. She did not miss a beat and was able to do everything I asked of her without hesitation. Had I been in that environment with Bear, I am not certain I would have enjoyed myself as much. he requires much more management and vigilance and preparation before he can even think about performing. I think we will try to attend a few more shows this spring. I don’t think she is as mature as the other dogs that will be in her class but I do think that gaining ring experience and exposure to new environments is a good thing. Epic and I have been taking advantage of the mini courses I have been setting for my Novice Rally Class and I am seeing some improvement in her ability to stay with me between stations. could it be that my baby girl is growing up? Below is a video from last Friday. When I last reported before Christmas, Epic was coming up to her 6 month “birthday”. Between a short holiday over Christmas and being incredibly busy at Prairie Dog Daycare, it was easy to let things slide. Epic is just over 7 months old now and old enough to come to ‘big dog’ daycare. She comes to work with me 3 days a week and plays with a number of other dogs both larger and smaller than her. She is definitely what I call a ‘play chameleon’, meaning that she is able to adjust her play to the intensity and preferences of her playmates. That being said she is not a pushover and, if dogs are doing something she doesn’t care for, she uses appropriate cues to end their behaviour usually, she stops, stands still walks away and, if another dog is really pushy, will bark and snap at them. Training-wise, we have not been focusing on anything specific. We have been working on pivots, individual rally exercises, heeling, hand stacking for conformation conformation gaiting and conformation stand for exam. 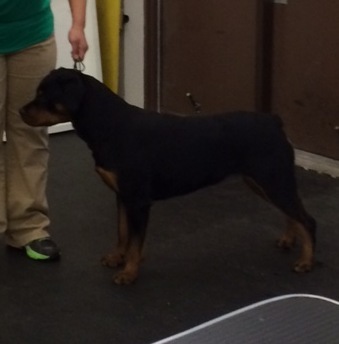 Since the beginning of February we have been attending a pet dog class and a conformation handling class to work on all of the above in a busy, noisy environment. 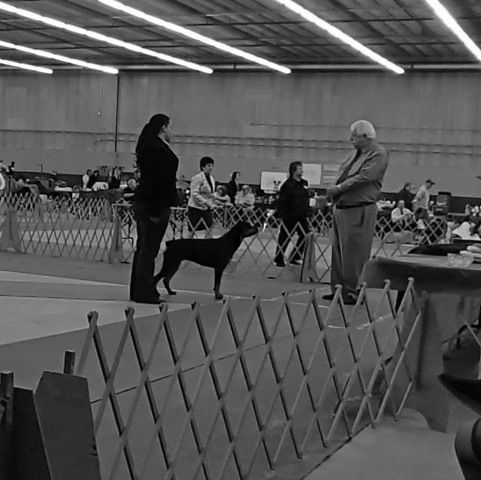 While outdoor adventures and exercise are pretty much impossible in this weather, we still go to the groomers, to the dog wash, to the vet weekly for weigh-ins and last month, she came with me to a rally judging assignment in Prince Albert, Saskatchewan. Now that I have a better idea of who she is, I am beginning to set some goals which I’ll share in my next post. I have gradually been introducing Epic to some different adult dogs from the ones I typically allow to meet puppies. I am doing this gradually because a negative experience can have long lasting effects. So far she’s handling things very well with new dogs: she’s greeting them appropriately, inviting them to play and using great calming signals when play gets too rough for her. Found the treat Jar in about 5 seconds! Epic Supervising Dr. Barclay’s note taking. Epic and I went to the vet to have her ears re-checked after an ear infection. All looked well so we went ahead and got her rabies vaccine. I have been delaying Rabies as long as possible. Her breeder would prefer a year but in order to attempt the CGN this winter, I need to get a municipal licence and in order to get a municipal licence, I need proof of vaccination against rabies. Go Figure. I thought I post an update on our left pivot progress. We have been working away on the stool and Epic can pivot 360 degrees with me so it’s time to up the ante a but by trying the pivot on a different, lower surface, and I have chosen the FitPAWS Balance Disc. The disc also happens to be a bit more of a workout for her, as she has to use all of those stabiliser muscles (front and rear) to stay on the disc while turning. I am pleased with her progress so far. She is pivoting nicely and you can see she is beginning to move back into heel position as she pivots and then look at me as if to say “Well, I did it, cookie PLEASE!”. I am going to keep up the disc work because I think it’s a great leg workout but over the next week I am going to start using one of my FitPAWS target in place of the disc. Up until now, have been moving around the disc but since the target is completely flat, I can step on it too and begin to make my pivots more and more “in place”. Recently, while practicing our rally moves, Epic has been drifting away. It does not appear to me that she drifts to anything but she kind of “checks out”. I am choosing to take this as a sign that she is not feeling well, stressed by something or that the work is not rewarding enough for her. Instead of insisting that she work (or using corrections), I am going to take a different approach that will involve micro-training and some of the great games in Control Unleashed. Today, I started teaching Epic the foundation of turning left by using our trusty stool. Turning left is one of a number of skills I think are important for rally dogs to have. The bonus is that pivoting on a raised surface is also a great way to strengthen a dog’s hindquarters and improve propriocetion. Finally, teaching her using shaping also gives her mind a bit of a workout. Once she is moving left with me, I’ll probably add a hand signal and verbal cue (get in) before I try to transfer it to the flat! Today, I started working on sit and down stays with Epic at home. First I started pivoting in front of her, then I started moving around her. Next I’ll start adding in some distance and then some distractions like toys and food. A good stay is important for all the dog sports I’d like to do with her so I figure we’d better get started on that. Today, I was able to get out and do some tracking with Epic. She is really having fun but boy do I have a lot to learn. The latest video is below. This is likely the last bit of tracking we will get in for the next few weeks. It’s going to be way, WAY too cold for us. Today, because the cold weather seems to give the dogs MORE energy, I took the dogs out for a long walk followed by a romp in the yard. Now that Epic is older, and taller, we can go for longer walks and thanks to my handy hands-free leash, walking both of them is easy! Post-walk, both dogs were happy and covered with frost! Epic came to work with me today and we practiced our pivots and our sit/stay and down/stay. I am working on these things in both environments at the same time to help her generalise the behaviour. She was able to stay while I walked around her (after a few tries) so I started walking away from her: sometimes coming back to reward her, sometimes calling her to me to reward her. We finished off the session with some retrieving. She LOVES to retrieve a tennis ball and will bring it back to my hand about 70% of the time. 29% of the time, she will drop it near me. 1% of the time she can’t help herself and takes the ball on a “joy ride”. My approach has been to click/treat for balls deposited into my hand, to offer no click/treat for balls dropped near me and, to ignoring joyrides because I don’t want to encourage the oh-so-fun game of keep away! She is already much better at brining it to my hand then Bear is so I’m going to keep encouraging this and hope it can transfer to a dumbbell once we begin working on a more formal retrieve for obedience. I took Epic to the vet this morning to have her ears looked at they have become gradually dirtier and itchier over the past week and I suspected an ear infection. Dr. Radcliffe took one look at her ears and said, yup it was an ear infection. We got a weeks worth of ear drops which will hopefully clear things up. We’ll go back for a recheck in a week or so to make sure the infection is gone. For good. It has been brutally cold here for a few days (-20’s . . CELCIUS!) and I have been thinking that Epic needs a coat because she has almost no undercoat. Luckily, Epic’s auntie Renee had a lovely coat just Epic’s size hanging around and it fit her perfectly! Today it was warm enough to go out tracking! After tracking disaster last week, tone he tracking groups that I have joined gave me some great ideas for out next track. Today, I took both Bear and Epic out. Epic’s track was on the whole, successful. She found most of the bait, most of the footsteps and made her way to the jackpot at the end of the track. One of the things I worked on today with Epic is heel position and sit @ heel. As we always do, we worked in 1-5 minute sessions after each potty break but now we have a game of tug/retrieving when we are done. I haven’t been taking a singular approach to teaching this: I have been using a combination of targeting, luring and shaping to teach her that 1.) it pays to be on my left side 2.) It pays to sit in heel position at my left side and 3.) It pays to come back to heel position if she finds her self out of position. By the end of the day she is sitting more or less straight beside me (not swinging her rear out) and she is catching her self when she gets ahead of me. Her natural tendency is to get out ahead of me (we call this forging in rally/obedience) which is an issue I can fix with time and appropriate reward placement. It has been rather cold lately which means less time outside for all of us so I decided to play some fetch indoors with Epic this afternoon. Sometimes she is not ready to give up a toy but is more willing if I have two toys. Today I switched it up and started clicking when she brought the ball back to my hand and offering a tasty morsel of food right away. Once she got that part down I started throwing the ball and then running away to hide from her so she had to come find me and bring the ball for a cookie and another ball throw. I call this Hide & Seek Retrieving and it’s *so* much fun! Epic and I had class this evening! Tonight we got to work on walking nicely on leash stays and sitting/standing while strangers approach. We used our walking time to practice heeling with distractions. Epic was much less distracted than she was 2 weeks ago but about 30 minutes into the class she got very sniffy and started hunting for invisible cookies. I treated this as a sign she was mentally “done” and we went back to our mats for some chill out and settle time. After that she seemed much more focused and on task. This is going to be a very important thing for me to remember. During the ‘sit nicely for an approaching stranger’ Epic sat while the stranger approached and spoke to me but our handshake was just too much she *had* to jump up and see what was in our hands! We tried again a few times and I was finally able to click and reward her for staying still. This is the very beginning of greeting a stranger in the CGN, and the stand for exam in Rally/Obedience. We also tried having her stand standing while a stranger approached to go over her which is what will happen in the conformation ring her natural inclination is to visit people so I will be working on teaching her that her people will come to her if she can Just. Stand. Still. Epic is 5 months old today and has been with us for 3 months.